We can produce number plates for your kart or race team. 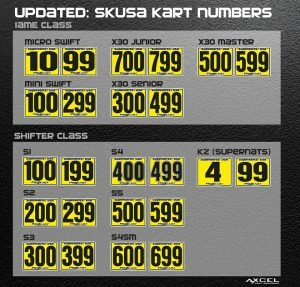 In fact, Axcel Fast Graphics is an official provider of number plates for Superkarts! USA. We can produce your regional or national number plates and ship them directly to you. Or if you race in a different series or desire custom designed number plates with your preferred colors or sponsors, contact us and we’ll take care of you. For your convenience, we have simplified the ordering process for SKUSA number panels. *Extra side plates can only be purchased with a purchase of a full set. A rush fee of: $10/set will be applied if ordered within the week needed. What Is Your Letter Designator? What Shape Do You Require (Non-Standard Cuts are priced at $79.95)?